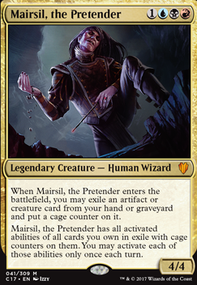 Mairsil, the Pretender tends towards combos but some of them are more like wicked interactions and are not infinite. 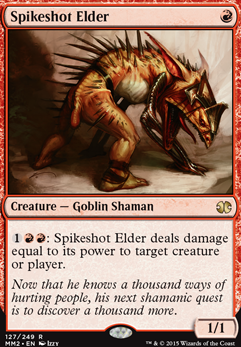 Spikeshot Elder // Hateflayer + Tree of Perdition + a way to reset Mairsil's toughness like AEtherling , this allows you to kill 1 player each turn. Laboratory Maniac + Mirror-Mad Phantasm , empty library with a caged mirror mad and win. And using Pestilent Souleater or Vector Asp with AEtherling is sneakier than most people realize. ScottyKnowsMTG on BUGr Nonsense - Hulk Inc.
DrukenReaps on Favorite Voltron Commander and why? I love Mairsil, the Pretender . 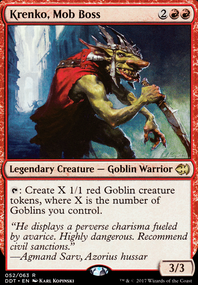 He can be troublesome to get going because you really need to cage a flicker effect like AEtherling . Once that is out of the way though he turns into one of the hardest to kill commanders I've ever played or seen played. I usually don't kill people with commander damage like a normal voltron deck does but the option is there. Usually I combo off with him in some gross fashion like Tree of Perdition + Spikeshot Elder . 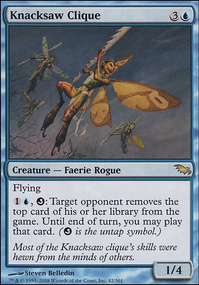 Still I tend to think of the deck in a manner similar to voltron because of how commander reliant it is. hkhssweiss on Krenko's Crazy Goblins!!!!!! Took a look over the list. Have a couple questions to ask first before I can offer you some cards you can consider! What is your budget? How much are you willing to spend for a single card? Is there any house rules you play by? Ex. No infinite combo, No land destruction, etc. Aside from tribal theme, what deck direction do you want to go to? Aggro, combo, value? 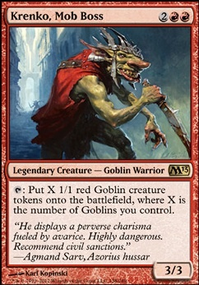 Some cards right away I would add albeit is Goblin Matron , Spikeshot Elder , Goblin Sharpshooter , Dark-Dweller Oracle , Goblin Ringleader , and Thornbite Staff . 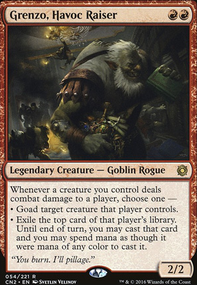 Pretty much value cards that a core Krenko should have, you have most of the great Goblin cards needed. Looking forward to hearing your response! DrukenReaps on Should I Pretend This Or That? carlmoores I'm always happy to see another Mairsil player join the ranks :) He does play wildly different then most other things. Takes a little while to wrap your head around. Hopefully I have some good answers for you. I usually find myself flickering Mairsil rather than untapping him. 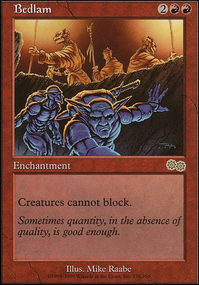 I have some untap because it isn't useless but unless you have a lot in the cage or have one of the 'abuse' cards like Quicksilver Elemental in play each ability can only be used once per turn. I just find flicker effects more useful than untap effects. Which is why I also put such an emphasis on haste. I wouldn't run a lot of hard hitting self mill like Traumatize but running 1-3 things like it or Mirror-Mad Phantasm can take you from doing poorly/ok to winning the game. I had that happen the other day actually. I was doing ok and then got mirror-mad to dump more than half my deck, followed up with Deadeye Navigator and went infinite. Definitely worth a few spots but can backfire. Usually when I use Buried Alive I grab a flicker or haste effect and Spikeshot Elder + Tree of Perdition and win or come close to winning that turn. So I don't think Archaeomancer is needed to recur buried alive if you use it that way. If you are looking for more long term value and are using Entomb and Final Parting it is definitely worth testing. 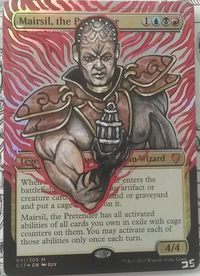 That would also give you another wizard for Galecaster Colossus which I have found to be really useful in and out of the cage. Think I covered all your questions pretty well? Let me know if I can be of more help. Rogue_Toaster Thanks, glad I can be of help. Getting to use some pet cards of my own is actually part of why I even built this, lol. I also completely forgot Jaya Ballard, Task Mage is a spellshaper... She has been very worth it. I could see the altar being a decent addition too.